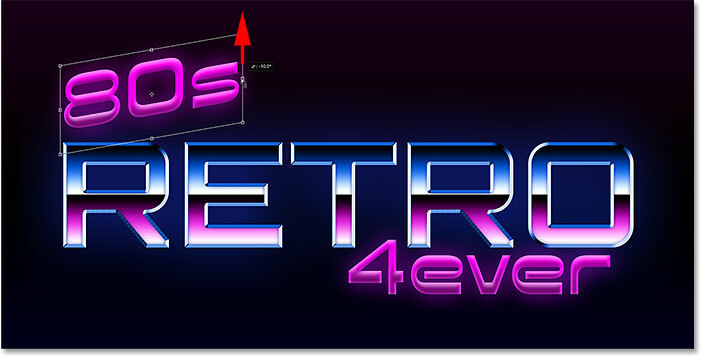 In this tutorial, we'll learn how to create a fun 80's retro text effect in Photoshop, with shiny chrome and neon letters! 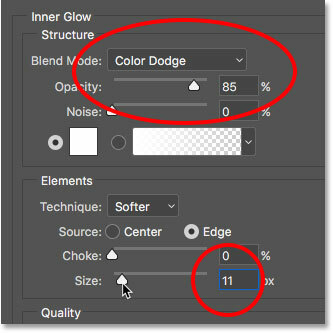 To create the effect, we'll use Photoshop's layer styles, which will not only make things easy but will also keep our text fully editable. We'll use a Gradient fill layer to create a background for the effect. And to finish things off, we'll add a few sparkles around the text using Photoshop's Brush Tool! Much of the retro effect will be done using gradients, and we'll be creating several custom gradients along the way. 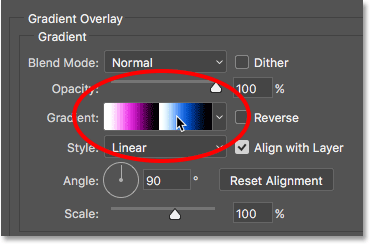 To save time in the future, we'll save each custom gradient as a new preset. 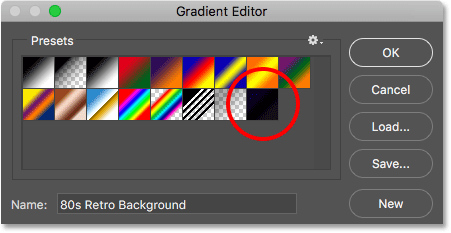 That way, the next time you want to create the retro effect, you'll be able to quickly select the gradients you need from the presets rather than having to recreate them all from scratch. I'll be using Photoshop CC here but everything we'll be doing is fully compatible with Photoshop CS6 and with earlier versions of Photoshop. I'll also be using a couple of retro-style fonts that I downloaded from Adobe Typekit, available with most Creative Cloud subscription plans. 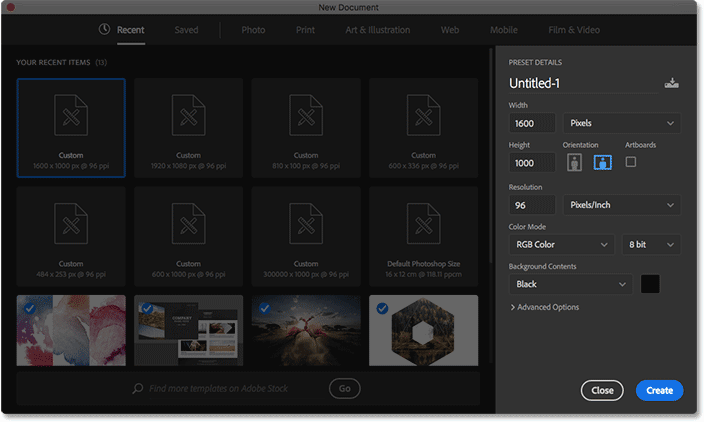 If you don't have access to Adobe Typekit, no worries. 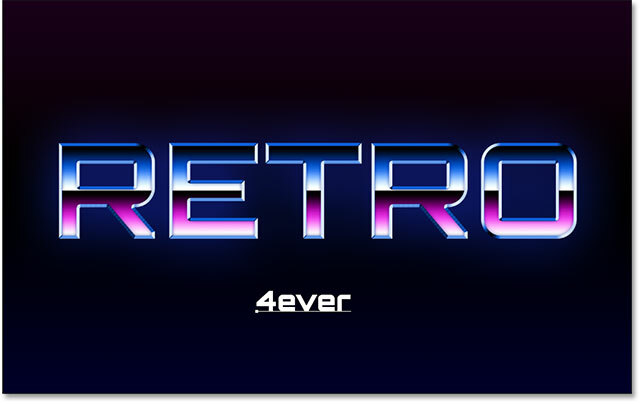 A quick Google search will find lots of free retro fonts you can use. There's a lot of steps, but they're all super easy, so if you're ready, let's get started! This opens the New Document dialog box. 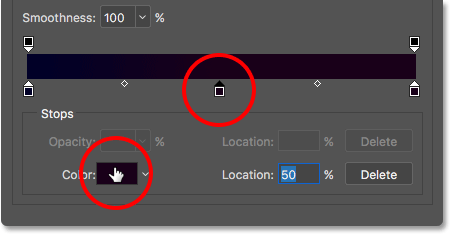 If you're using Photoshop CC, you'll see the newly-redesigned version of the dialog box. 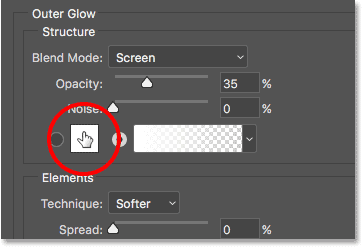 If you're using CS6 or earlier, you'll see the older, traditional dialog box. 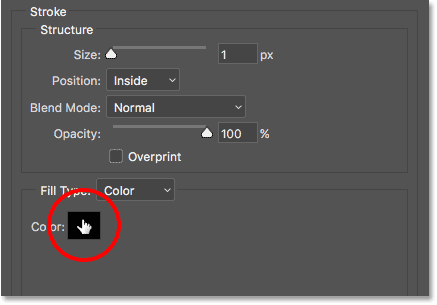 Let's look at the Photoshop CC version first, and then we'll look at the older version. Don't worry, this will only take a minute. 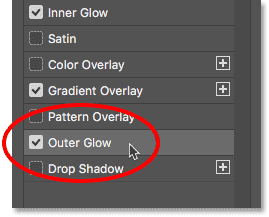 The redesigned New Document dialog box in Photoshop CC. 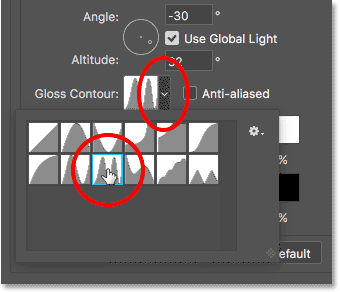 The Preset Details panel is highlighted. 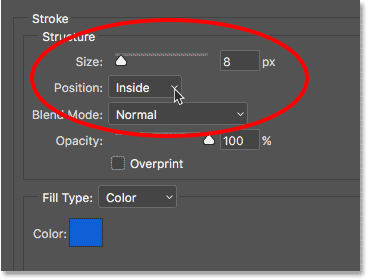 Setting the Width, Height, Resolution and Background Contents options in Photoshop CC. 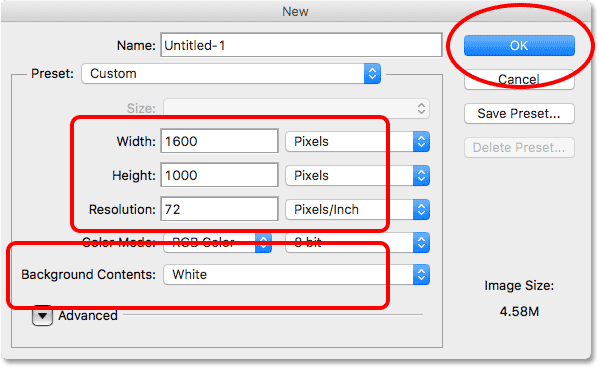 Setting the Width, Height, Resolution and Background Contents options in Photoshop CS6. 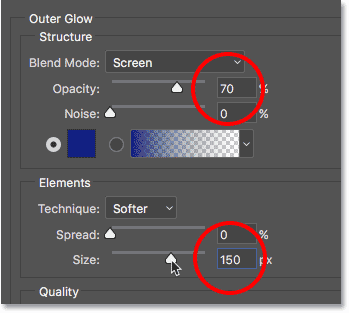 Choosing a Gradient fill layer. 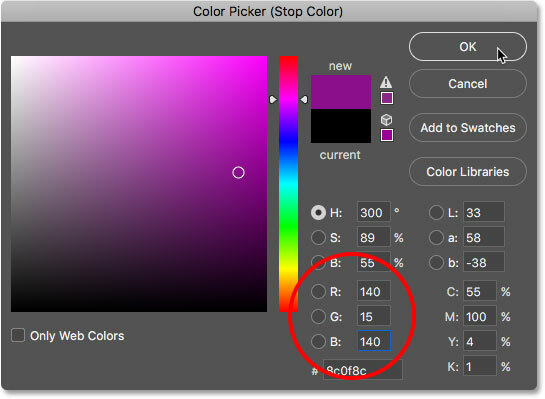 Clicking the color swatch in the Gradient Fill dialog box. 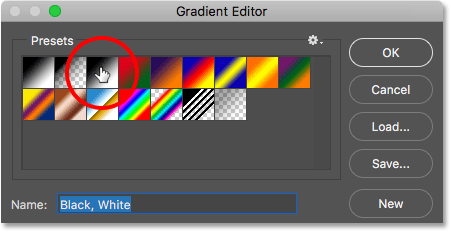 Selecting the Black, White gradient in the Gradient Editor. The preview bar showing the current colors of the gradient. 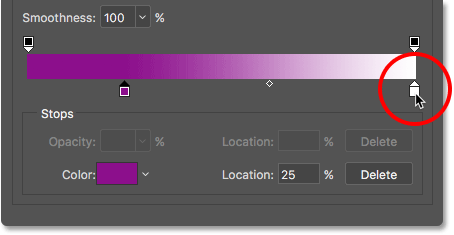 We can edit the colors of the gradient using the color stops directly below the preview bar. At the moment, there are two color stops; a black one on the left and a white one on the right. 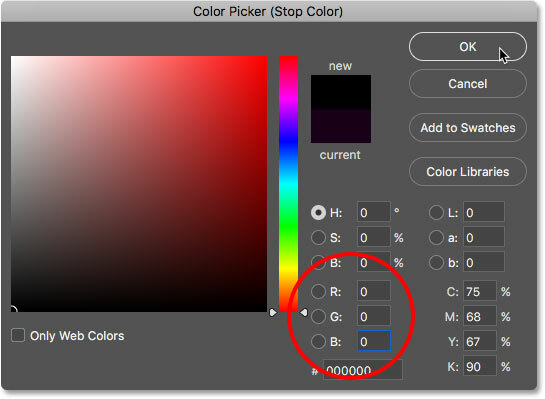 Clicking the color stop on the left, then clicking the color swatch. Choosing a dark blue for the left color of the gradient. Clicking the color stop on the right, then clicking the color swatch. Choosing a dark pink for the color on the right. 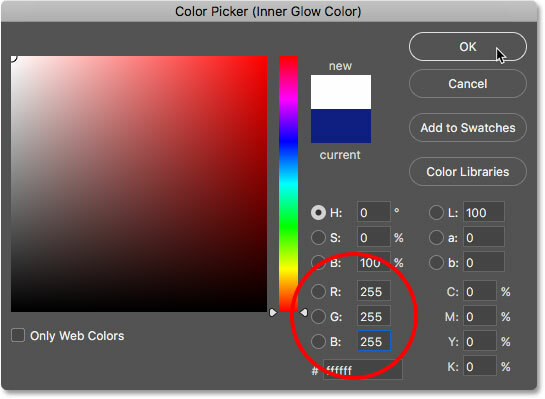 Click OK to close the Color Picker. We now have a gradient running from dark blue on the left to dark pink on the right. 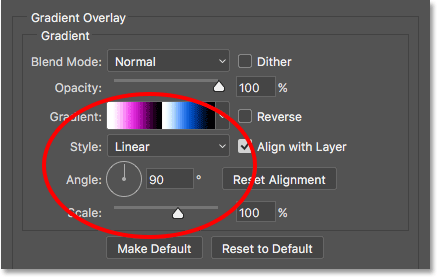 Let's add a third color in the middle of the gradient. 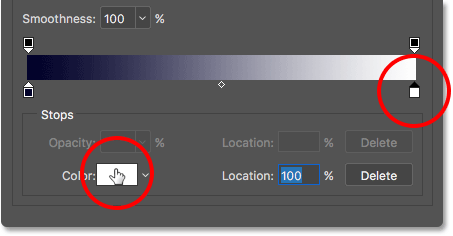 Clicking below the center of the preview bar to add a new stop, then clicking the color swatch. Choosing black for the middle color. Setting the Location of the new color stop to 50%. 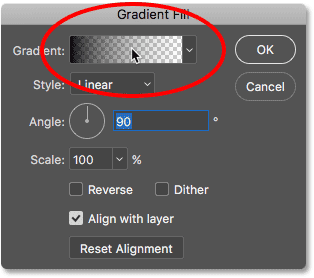 Before we close the Gradient Editor, let's save our custom gradient as a new preset. 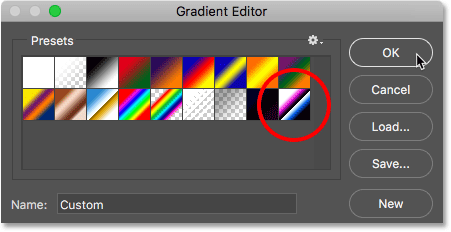 In fact, we'll save all of our custom gradients as presets as we go. 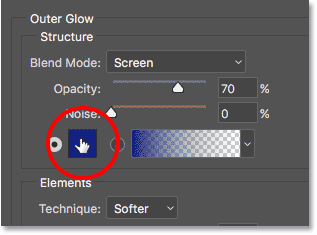 That way, the next time you want to create this effect, you'll be able to quickly select the gradients from the Presets area rather than needing to create them again from scratch. 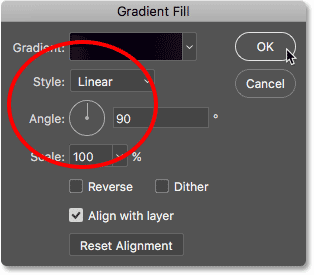 Entering a name for the gradient, then clicking "New". 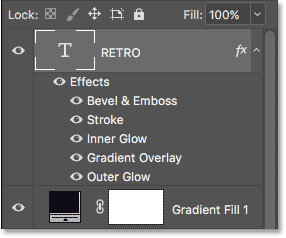 The "80s Retro Background" gradient appears as a thumbnail in the Presets area. Checking the Style and Angle options. 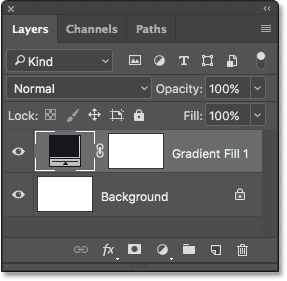 The Layers panel showing the Gradient fill layer. 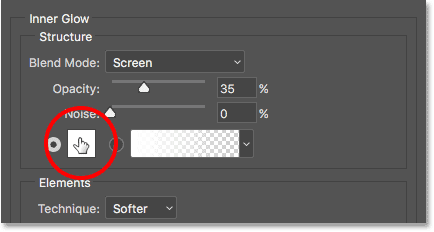 With the Type Tool selected, choose your font options in the Options Bar along the top of the screen. As I mentioned earlier, I'll be using a couple of fonts from Adobe Typekit, but you'll find lots of great (and free) retro fonts on Google. Setting the font to Orbitron Black and the size to 72 pt. Clicking the color swatch to change the type color. Choosing white for the type color. Clicking the checkmark to accept the text. Holding Shift and dragging a corner handle to resize the text. Moving the text into the center. Clicking the checkmark to exit out of Free Transform. 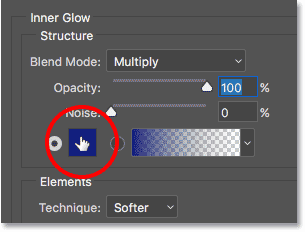 Clicking the Layer Styles (fx) icon. 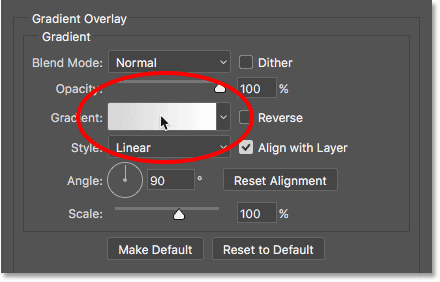 Choosing Gradient Overlay from the list of layer styles. 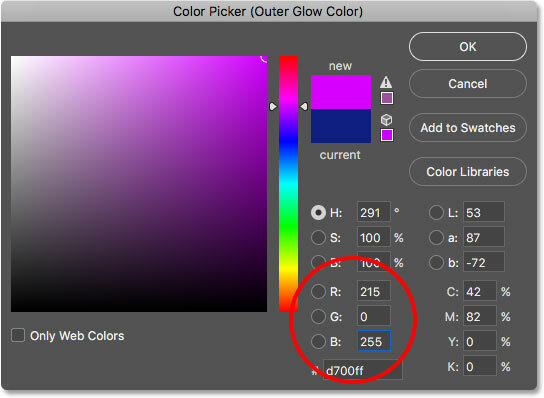 Clicking the gradient color swatch. Choosing the Black, White gradient to start. 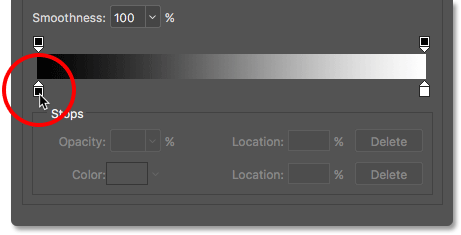 The Black, White gradient appears in the preview bar in the bottom half of the dialog box, with a black color stop below the left side of the bar and a white color stop below the right side. 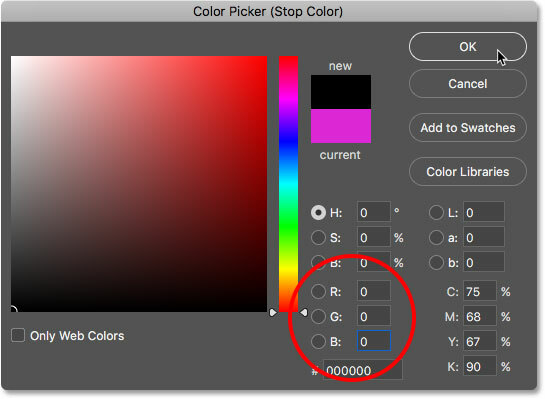 Double-clicking on the black color step on the left. 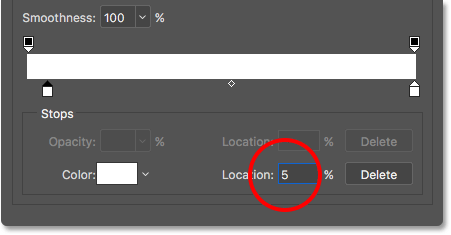 Changing the Location to 5%. Adding a new color stop. Choosing pink from the Color Picker. Setting the Location to 25%. Setting the Location to 50%. Adding another new color stop. Setting the Location to 51%. Choosing blue from the Color Picker. Setting the Location to 75%. 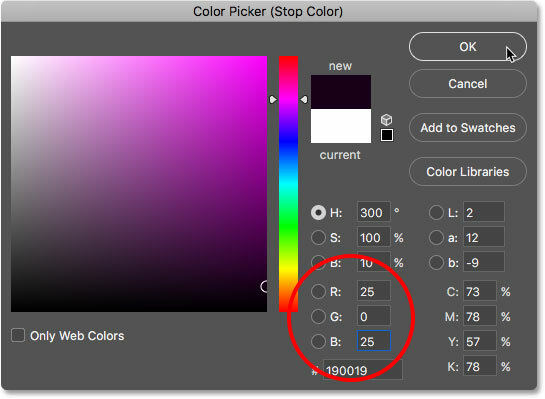 Double-clicking on the color stop on the right. Choosing black for the final color. Changing the Location to 95%. 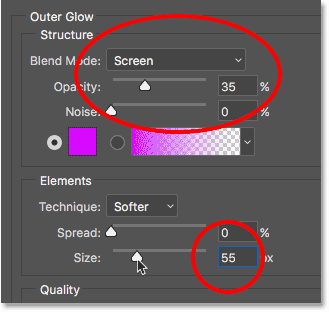 Naming and saving the custom gradient as a preset. The new preset has been added. The text after applying the Gradient Overlay style. 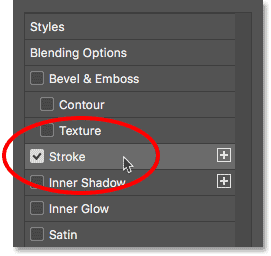 Selecting the Stroke layer style. 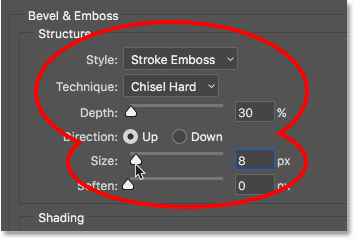 Changing the stroke color to blue. The Size and Position options. The text with the gradient and stroke applied. 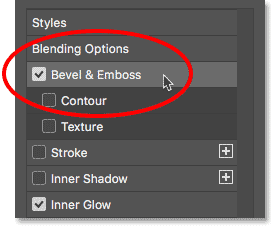 The Structure options for Bevel & Emboss. 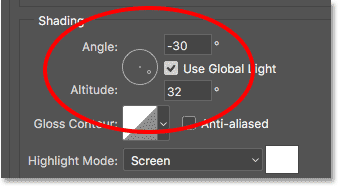 The Angle and Altitude options. Selecting the Ring - Double contour. 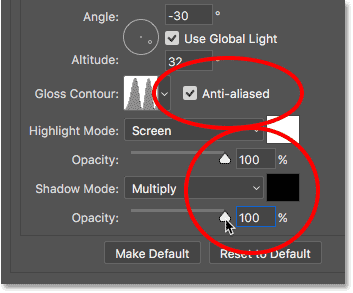 Selecting Anti-aliased, then setting the Highlight and Shadow Mode opacity to 100%. The effect after applying Bevel & Emboss. 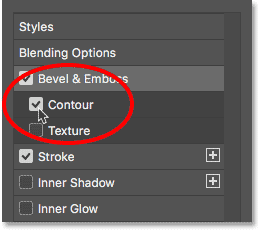 Step 14: Turn On "Contour"
Clicking inside the "Contour" checkbox. The effect after turning on Contour. Adding an Inner Glow layer style. Changing the Inner Glow color. Choosing a darker blue from the Color Picker. The effect with the Inner Glow applied. Adding an Outer Glow layer style. Changing the Outer Glow color. Choosing the same shade of blue for the Outer Glow. 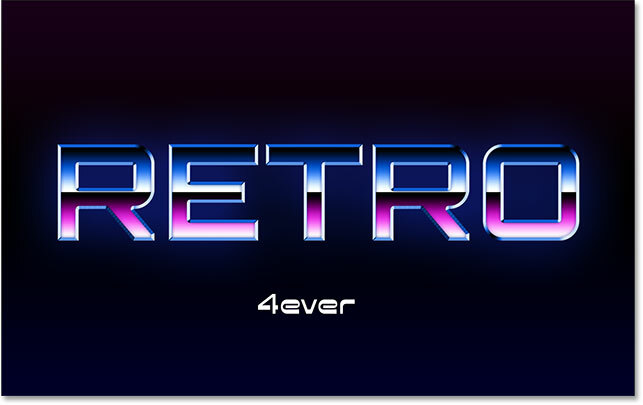 The final retro chrome text effect. 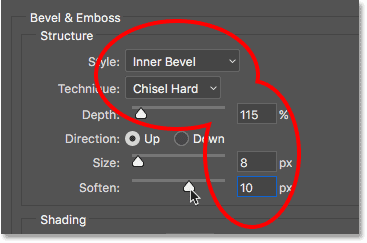 The layer styles are listed below the Type layer. 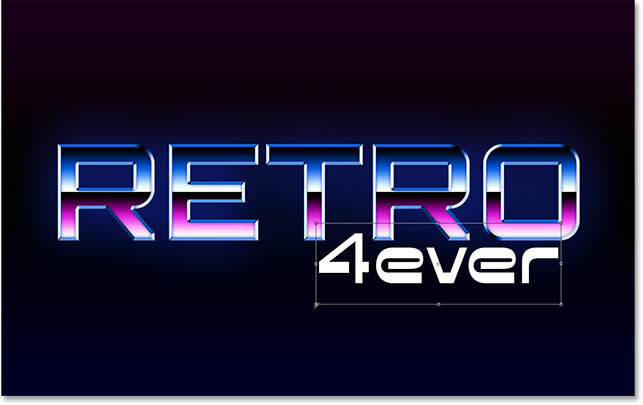 Clicking below "RETRO" and typing "4ever". 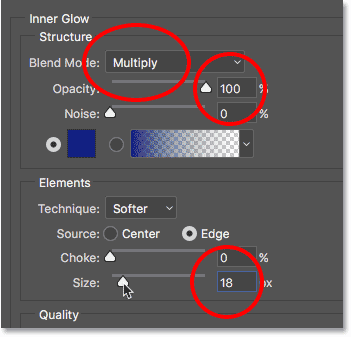 Choosing a different font in the Options Bar. 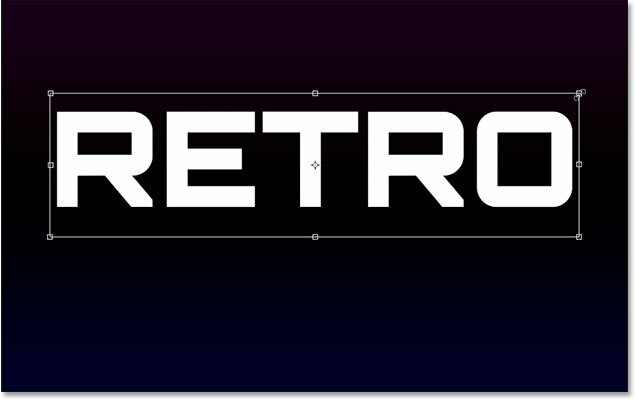 The reason we didn't change the font before adding the second word is because we still had our original Type layer selected in the Layers panel, which means Photoshop would have changed the font for the word "RETRO", and that wasn't what we wanted. To keep the original font for the first word, we needed to add a second Type layer before changing the font. The word "4ever", now with the new font. Resizing and repositioning the second word. 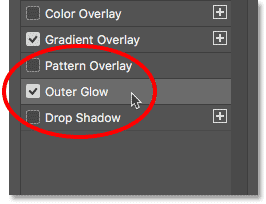 Choosing the Gradient Overlay style. 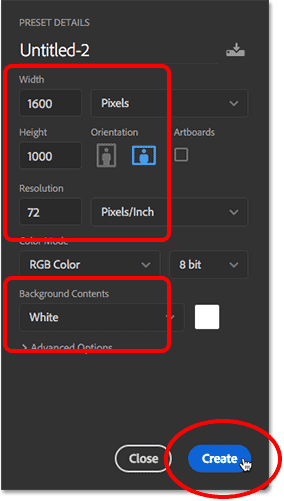 Choosing the Black, White gradient from the Presets. Choosing a dark pink in the Color Picker. Changing the Location to 75%. 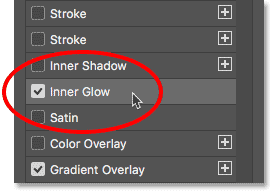 Naming and saving the new gradient preset. The Presets area showing the new 80s Retro Neon preset. The text after applying the gradient. 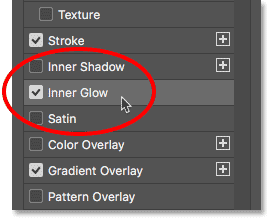 Clicking the Inner Glow color swatch. Changing the Inner Glow color to white. The text after applying Inner Glow. Adding a Bevel & Emboss layer style. 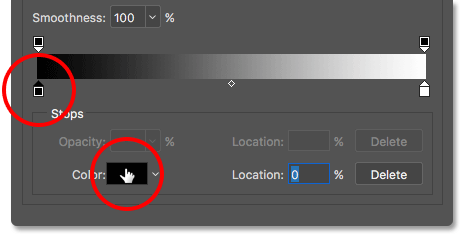 Double-clicking on the Linear contour thumbnail. Adding an Outer Glow style. Choosing pink for the Outer Glow. The effect with all of the layer styles applied to both words. 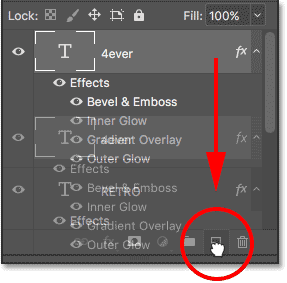 Dragging the "4ever" Type layer onto the New Layer icon. 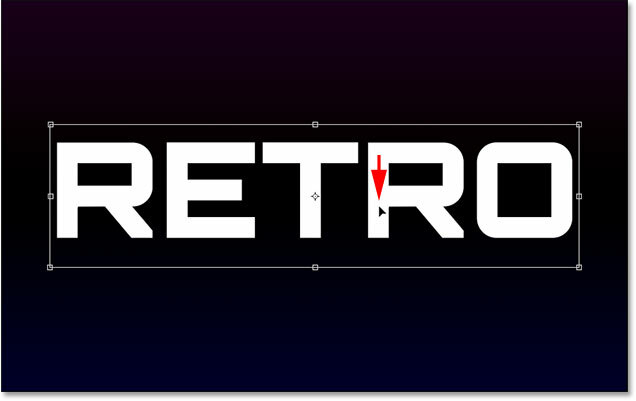 Dragging the copy above the word "RETRO". 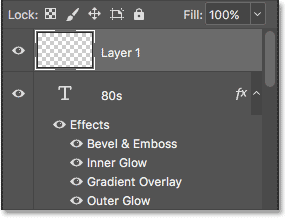 Step 29: Change The Word To "80s"
Double-clicking on the Type layer thumbnail. The text is highlighted and ready for editing. 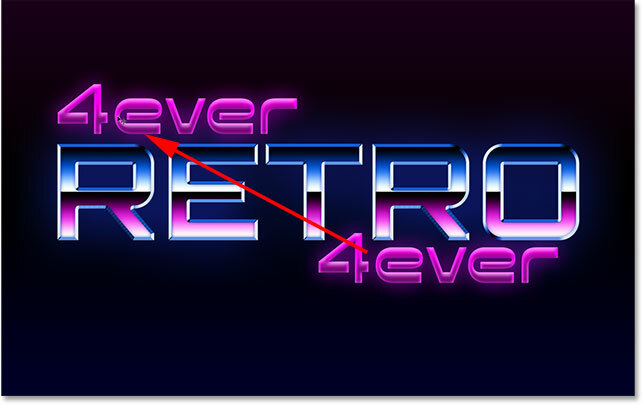 Changing "4ever" to "80s", then clicking the checkmark. 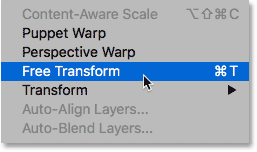 Going to Edit > Transform > Skew. Skewing the word "80s" by dragging the right Transform handle upward. Clicking inside the Transform box and dragging "80s" into position. Clicking the checkmark in the Options Bar. 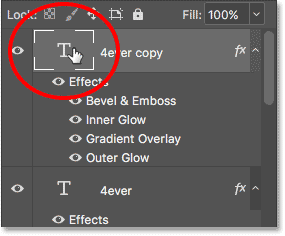 The new layer appears above the Type layers. 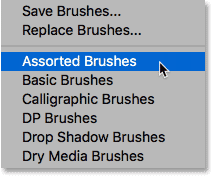 The brush we need for the sparkles isn't found in Photoshop's default brushes so we'll need to load in one of the other brush sets that's included with Photoshop. 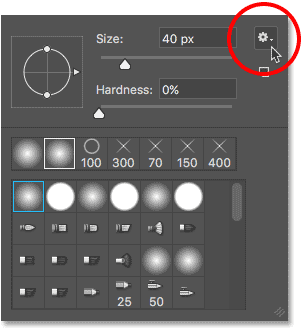 Clicking the menu icon in the Brush Preset Picker. Choosing the Assorted Brushes set from the menu. 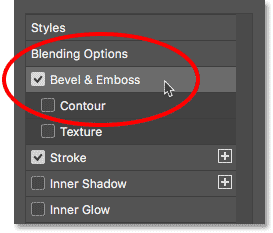 Clicking "Append" to add the new brushes. Switching from the thumbnail view to the list view. 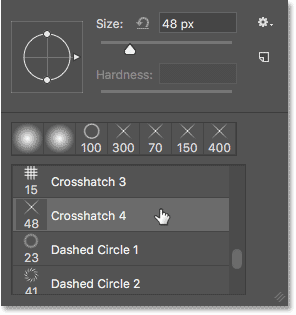 Double-clicking on the "48 px Crosshatch 4" brush. 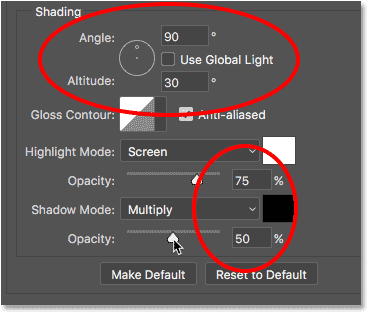 Make sure your brush color is set to white by pressing the letter D on your keyboard to quickly reset your Foreground and Background colors, which will make your Foreground color black and your Background color white. 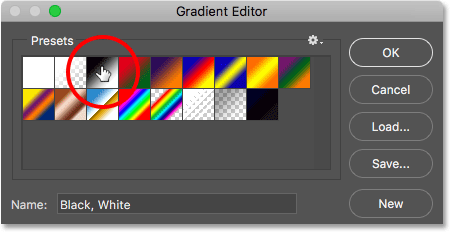 Then, press X to swap them, setting your Foreground color to white. 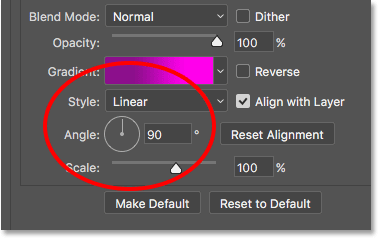 Press "D", then "X" to set your Foreground (brush) color to white. 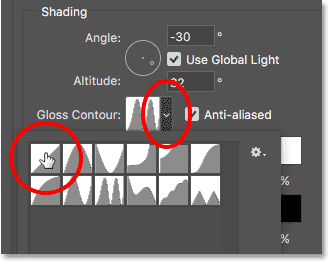 Before we add our sparkles, let's change the angle of the brush, again to add more interest. Press the F5 key on your keyboard. 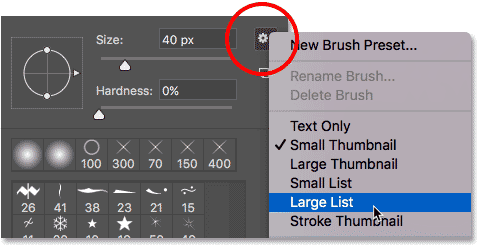 This is a quick way to open Photoshop's main Brush panel. 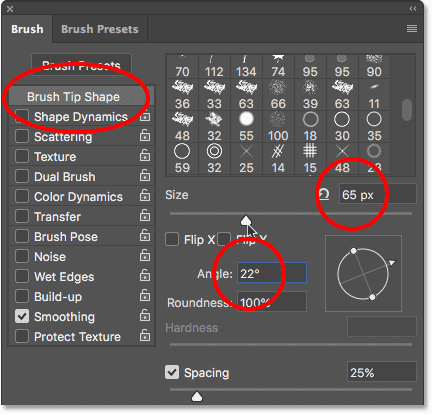 Changing the angle to 22° and the brush size to 65 px. 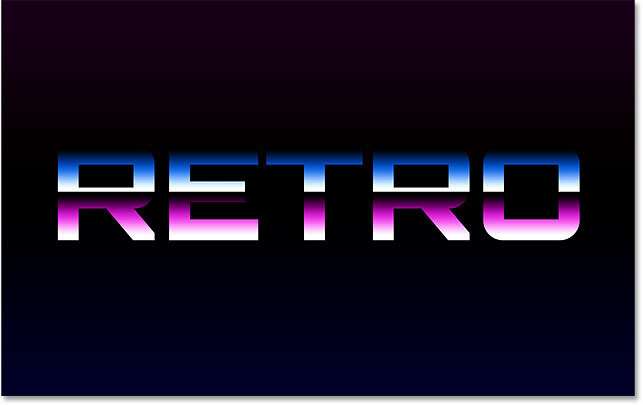 Clicking around the word "RETRO" to add sparkles. 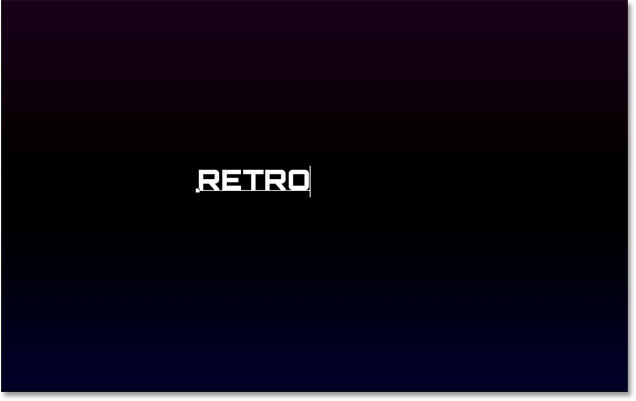 The final 80s retro text. And there we have it! 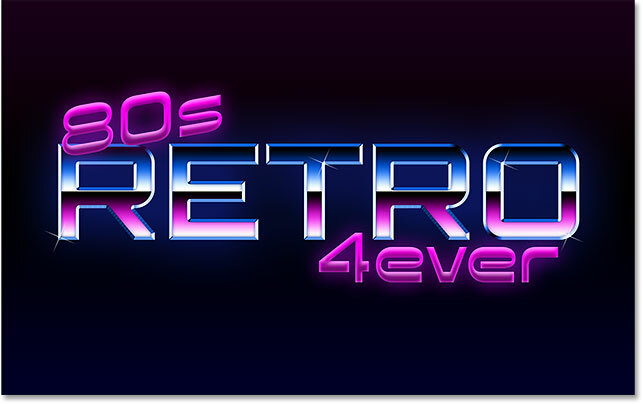 That's how to create a fun, 80s retro text effect in Photoshop using layer styles and custom gradients! Visit our Text Effects section for more Photoshop text effects tutorials!